Irving Stone (born Tennenbaum, July 14, 1903, San Francisco, California – August 26, 1989, Los Angeles) was an American writer, chiefly known for his biographical novels of noted artists, politicians and intellectuals; among the best known are Lust for Life (1934), about the life of Vincent van Gogh, and The Agony and the Ecstasy (1961), about Michelangelo. Born Irving Tennenbaum, he was seven when his parents divorced. By the time he was a senior in high school, his mother had remarried. He legally changed his last name to "Stone", his stepfather's surname. Stone said his mother instilled a passion for reading in him. From then on, he believed that education was the only way to succeed in life. In 1923, Stone received his bachelor's degree from the University of California, Berkeley. After receiving his M.A. there, he worked as a Teaching Assistant in English. He met his first wife, Lona Mosk (1905–1965), who was a student at the university. On money provided by her father, Los Angeles businessman, Ernest Mosk, the young couple went to Paris. Irving and Lona returned to the United States in the 1930s from Europe, where he had been researching Van Gogh for six months. In 1931 they resided in New York's Greenwich Village where he finished Lust for Life, the biographical novel about Van Gogh that set his career in motion, according to the NY Times obituary of August 28, 1989. According to the Times, Lust for Life (the title suggested by his first wife) was rejected by seventeen publishers over three years before being published in 1934. Stone's first marriage ended in New York. As Lona Mosk later told her son, James Earnest Packer, "I got bored having to sit around all day telling Irving how wonderful he was!" Stone took up with his secretary Jean. After he was divorced from Lona, he and Jean married. This later marriage lasted until Stone's death in 1989. Jean Stone died in 2004 aged 93. During their years together, Jean Stone edited many of his works. The Stones lived primarily in Los Angeles, California. They funded a foundation to support charitable causes they believed in. When at home, Stone relied upon the research facilities and expertise made available to him by Esther Euler, head research librarian of the University of California at Los Angeles. He dedicated books to her and thanked her in several of his works. According to his afterword for Lust for Life, Stone relied on Van Gogh's letters to his brother Theo. Stone additionally did much of his research "in the field". For example, he spent many years living in Italy while working on The Agony and the Ecstasy, a novel about Michelangelo. The Italian government lauded Stone with several honorary awards during this period for his cultural achievements highlighting Italian history. Although best known for his novels, Stone also wrote a number of non-fiction books. One was a biography of Clarence Darrow. In his book They Also Ran, about the losers in presidential campaigns, Stone criticizes William Jennings Bryan as an egocentric who never admitted being wrong. Stone argues that because Bryan led a privileged life, he could not feel the suffering of the common man. He asserts that Bryan only acted as a champion of common men in order to get their votes. Stone claims that none of Bryan's ideas were original, and that he did not have the brains to be an effective president. He calls Bryan one of the nation's worst Secretaries of State. He believes that, as President, Bryan would have supported many blue laws. In Stone's opinion, Bryan had one of the least disciplined minds of the 19th century, and McKinley, Roosevelt and Taft all made better Presidents than Bryan would have been. 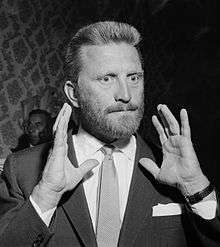 Amsterdam, 1956 : Kirk Douglas describes to the press his role as Van Gogh in the movie Lust for Life. In 1953, a popular film version was made of The President's Lady based on his 1950 novel of the same name, starring Charlton Heston as Andrew Jackson and Susan Hayward as Rachel Donelson Jackson. In 1956, a film version was made of Lust for Life, based on his 1934 novel, starring Kirk Douglas as Van Gogh. In 1965, a film was made of The Agony and the Ecstasy, starring Charlton Heston as Michelangelo and Rex Harrison as Pope Julius II. Stone's 1975 book The Greek Treasure was the basis for the German television production Der geheimnisvolle Schatz von Troja (Hunt for Troy, 2007). 1960, he received an honorary Doctorate of Letters from Berkeley, his alma mater.